The Reuter Organ (opus 2175) at The Shadyside Presbyterian Church represents the culmination of a long and diligent effort to obtain an organ of a size, scope and quality to match the magnificence of the sanctuary, and to serve as the cornerstone of a strong and vibrant music ministry. The first organ at Shadyside was installed in 1875 by the Hook and Hastings Company of Boston. This three manual organ was replaced in 1903 by the W.W. Kimball Company of Chicago. In 1926 E. M. Skinner of Boston built a large four manual instrument which was encased across the center of the chancel. In 1938 sanctuary renovations moved the organ into two chambers on either side of the chancel- the resulting sound was less than satisfying. In 1957 the Skinner organ was replaced by a four manual organ built by M. P. Möller of Hagerstown, Maryland. A gallery organ was added in 1973 (given in memory of Dr. Howard C. Scharfe by the Lazear Foundation). Extensive renovations were done in 1989 in an attempt to make this a more successful instrument. In 1993 it was determined to retain the best of the pipe work, including a new magnificent Trompette-en-Chamade, and to incorporate them into a totally new instrument to be built by the Reuter Organ Company of Lawrence, Kansas. Building and installation were completed by November of 1994. The Reuter console has four manuals; the natural keys are of bone with sharp keys of rosewood. The manuals have tracker touch. The pedal keyboard has maple naturals and ebony sharps. The 105 rank organ is controlled by 170 draw knobs which have rosewood stems; intramanual couplers are controlled by knobs placed in their respective divisions; intermanual and manual to pedal couplers are controlled by tilting tablets placed above the top manual along with the Great/Choir transfer and Pedal Divide tablets. The Chancel organ stops and couplers are engraved in black; Gallery organ stops and couplers in red; and all sub and super couplers and mechanical controls are engraved in blue. Fourteen of the ranks of the Great organ are exposed on either side of the apse in the chancel. The large Harmonic Flute and Principal pipes are made of polished zinc. The smaller pipe work is made of polished spotted metal. 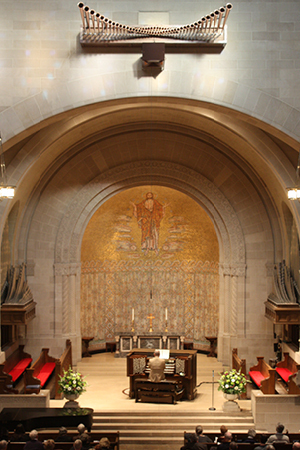 The color and design of the exposed pipe work is planned so that the Byzantine apse with its gold mosaic of the figure of Christ, by Rudolf Schefller, remains as the chancel focal point. Generously scaled, the sound of this Reuter Organ provides a warm, substantial ensemble of immense color, and dynamic diversity with the ability to build seamless crescendo and diminuendo. As an American Classic instrument, it incorporates the German, French, Italian, and English schools of organ building to create an instrument of enormous versatility. Tonal colors are available for the full range of organ literature. Of particular note is the inclusion of a true English Tuba in the Solo organ (speaking on a wind pressure of 20 inches) and a Doppelflöte (Double Mouthed Flute), included for its singular beauty of tone. The Pedal Posaune (filling one entire chamber) speaks on a wind pressure of 17 inches. The Trompette-en-Chamade in the lantern portion of the church speaks on a wind pressure of 15 inches. The bottom octave of both the Choir Gemshorn and Great Violone are from the previous Möller organ. The bottom octave of the Swell Lieblich Gedeckt is from the 1926 E. M. Skinner instrument. With this superb instrument, Shadyside Church has renewed its commitment to uphold the highest standards of sacred music and to carry that tradition vibrantly into the twenty-first century.